box store served on paper plates and eaten with clear plastic forks. The bag of salad was sitting on the counter, uneaten and unopened, next to the store brand ranch dressing. Some members have often joked that the salad was bought during the first year the lodge had been chartered. The conversation at the tables was pretty much the same conversation that had been going on for decades. The same old jokes and memories from years gone by. It was pleasant dinner talk by friends who, over the years, had become brothers - as sure as if by birth. The quiet, polite talk was stifled by the sound of the front door of the temple being loudly slammed. Heavy footsteps coming down the hall revealed that the noise was coming from Worshipful Brother Carl Bauer. His face red with anger as he stomped into the dining room waving several sheets of paper in his hand. Carl walked past the counter, and the lasagna, directly to the diners sitting at his normal table. “Well hi, Carl! How has your day been?” another past master asked while the whole table erupted in laughter, which only further infuriated Carl. Carl threw the printed pages in his hand onto the dining room table and spread them all out to be seen. Upon the pages were photos, some with still photos from movies or photograph from various pages of the Internet. Various words were superimposed on the photos, much like word balloons on the frame of a comic strip. 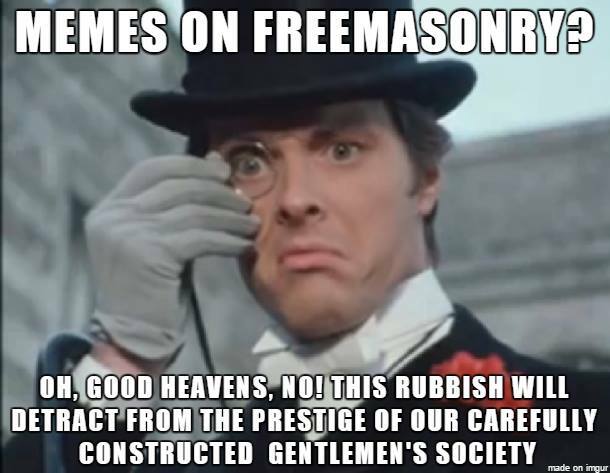 These pictures were making fun of masons, ranging from what we wear to how we wear it, even insulting pancake fundraisers and past masters. Pudge dropped his plastic fork and picked up one of the photos. The 50 year member placed the last bite of the toasted hot dog bun in his mouth. thinking to himself that hot dog buns which have been brushed with garlic butter makes a terrible replacement for actual garlic bread, then looked Carl in the eyes. Pudge nodded to the old man with a little grin. Carl’s reaction, however, was that his blood pressure nearly reached the point of stroke. Everyone talks lately about what our problems are, as they see it, but I still only see hand wringing and gnashing of teeth. I see very few suggestions on how to make it better. My opinion, we need to get back to Masonic education, and not just cut and dry lectures, but open discussion, make a statement about a symbol or something else and then let everyone talk about what it means to them and stay open minded, don't belittle someone who sees thing different than you do. Many lodges have have book cases filled with books on varying Masonic subjects, I know mine does, but when was the last time someone read one of them. Do you even have a way to check them out. Of course, also remember young members have families that include children. Have events that include the whole family, not just just the usual dinner event like Ladies nights, or Ladies At the Table. 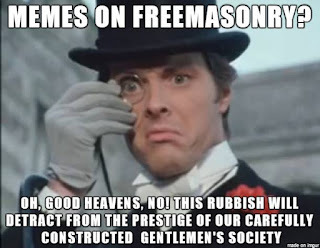 Brothers shouldn't be making memes and the Midnight Freemasons shouldn't be supporting such jocular behavior, it cheapens the Craft... never mind the fact that memes are the most annoying thing to happen to the internet, ever. The bit about hot dog buns was CLASSIC - nice article! Ryan-You are right, they shouldn't be creating memes. But then again they shouldn't have to. I truly believe the only reason these memes are being created is out of frustration. They want to be Masons and they want to be heard but they feel like the leadership of their bodies aren't listening to them. We constantly say we want young men to join our Fraternity and we want to know what they want to happen after they join then the leadership turns a deaf ear with the usually "We never done it that way" approach. I have been working with many of the younger Masons in my Lodge; I established a Study club and we discuss the things that they want to "get out" of Freemasonry. They want to learn. They want solemnity. They want fellowship. They want opportunities for leadership. They want Freemasonry.